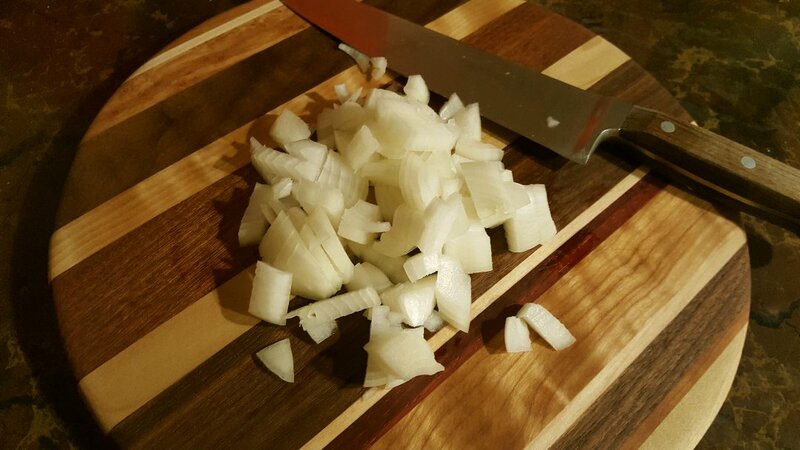 I think I stood there looking at my cutting board and the veggies for a good 5 minutes...It's funny when you get something nice and new, you don't want to upset its balance! Alex had to remind me why we bought them so I took the plunge! Done! Now my new-cutting-board-cold-feet-syndrome is gone! :) What a pleasure to cut on this board though. I did notice that a new set of knives might be in order, but a good set will be too expensive for us at this point in our lives, so we'll make do! We actually had our knives sharpened last summer but the guy did a horrible job. I remember as a kid, there was a knife-sharpening "guy" who drove around in his truck through the neighbourhood. All the moms would run out wildly with their knives so as not to miss him...funny scene! This was last night's dinner. I had a spaghetti squash in the fridge and wanted to have something more healthy since we've been eating a lot of melted cheesy food lately! This is my own recipe, Spaghetti Squash Bake. My recipe titles are more functional than creative lol...I do admit though, I didn't use the cutting board to chop the squash in half! I was afraid that I'd rip it in two, these squash can be hard to cut. This was a nice light meal and we finished up the strawberry shortcake for dessert. Alex added some raspberry jam to the whipped cream bowl, the strawberries and the leftover spongecake and it tasted very nearly like the English Trifle I made for Christmas! 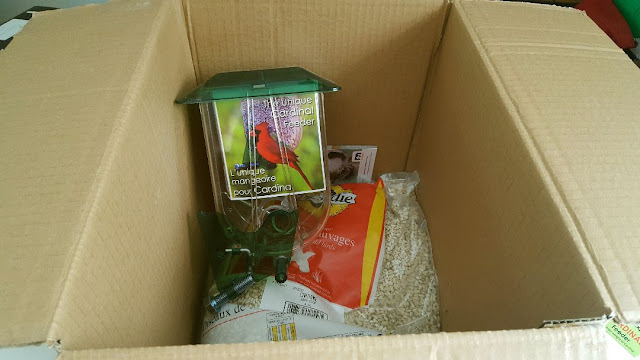 We are lucky that the pet store delivers on all orders over $65, so we order dog and cat food monthly - never have to drive all the way there and lug it home! Oh wait...this isn't dog and cat food! We got someone's bird order yesterday instead! This is the first time they've goofed up and luckily we have enough food for another week, so I'm giving them a break. Someone else got our order and had just called before I did. It's a nice feeder though! 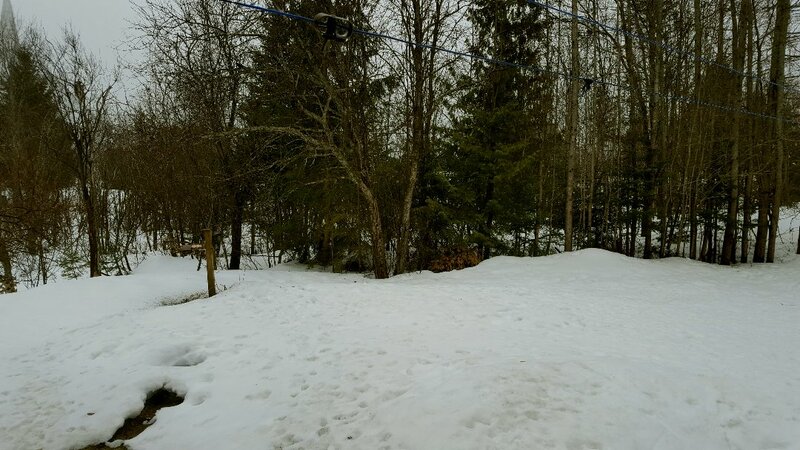 It's another miserable day up here in the Laurentians. But at least the ground is back! What you can't see is that it is filled with water. We have a rainfall warning today and tomorrow so we are not going out until probably Saturday when the sun is supposed to come back! I really hope our basement doesn't flood. 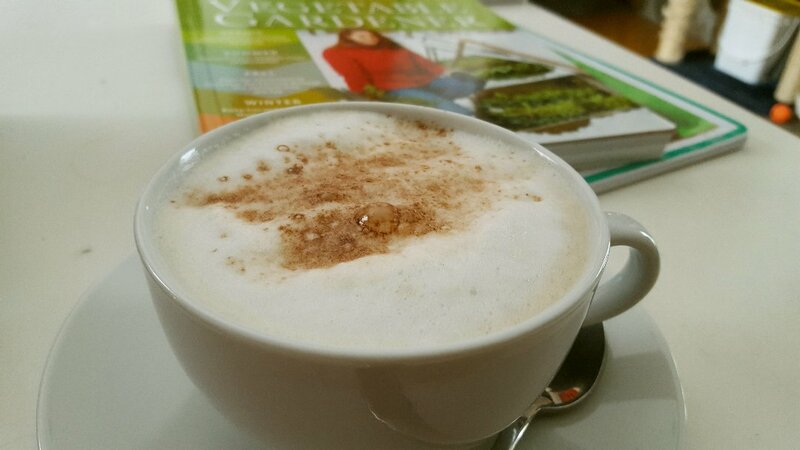 I made myself a "coffee-cino" this morning! I'm trying to gussy-up my mornings on really gray days, but I think it might be another day of sitting under the blankets reading my gardening book! What are you making for dinner? Lazy day = freezer food...I'm thinking fish and chips again. I would be scared to use those beautiful cutting boards too! I pinned your spaghetti squash bake as I too need to cut down on the rich meals...I'm blaming Pioneer Woman's delicious recipes! LOL! Today I am making that Mediteranean Salad I told you about and probably some banana bread. It is wet ground here too thus I can't mow and the grass (weeds) are getting really high! I will get out and pick up the yard though before I mow and also hang out some clothes. It was gray and rainy here yesterday but today is sunny and in the 60's F. Have a great day! Hi Rain! Just look at that beautiful cutting board - love it! Such talent and care goes into the making of those. I really wish I had insight and a bit of talent to work with wood. I have nothing! Your spaghetti squash looks good - and I must share that that is a miracle for me to say. I love squash, just not spaghetti squash. Its too "slippery" for me...its a texture thing. But I would have picked out the olives and feta and would have been happy with that! :) I should try it again tho...just give it another shot. Today we are sunny but cool. I think we are sitting around 7 or so. They are now not threatening snow anymore this weekend but a bit of rain. We got from 17 on Saturday to only 8 Sunday. But its early spring and even 17 on the prairies in April is odd. But I won't say no to it! 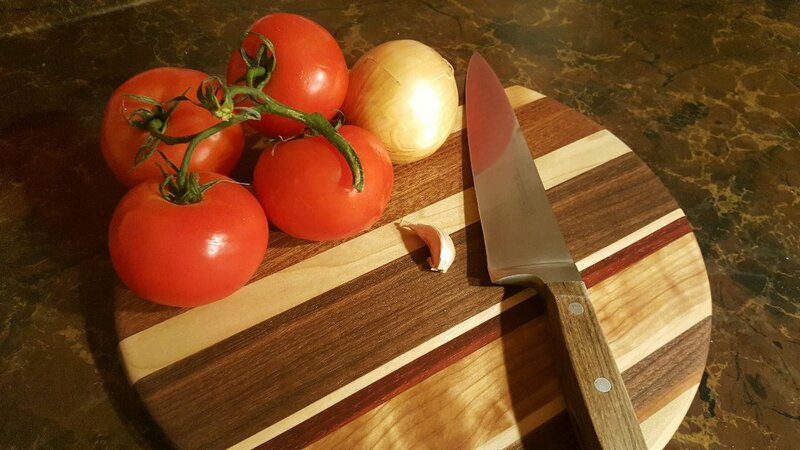 Enjoy your new cutting board -- it's a beauty! there are some very interesting properties on the Island and on the mainland that are pretty cheap - have a look around and enjoy! i would grab this property in a heartbeat if i could stand being involved in customer service! Hi Dianna :)) I know what you mean about the talent and care that's put into the cutting board, and to think someone compared it to a discount store $10 board...grrrr! 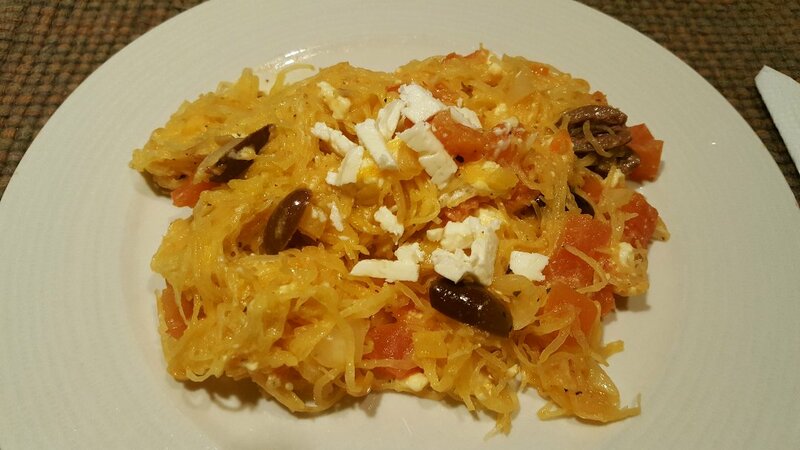 I love spaghetti squash TWICE a year AT MOST...I don't know why, but more than that, and I kind of start hating it. Go figure! I still haven't perfected getting it really nice and soft though, it's always a wee bit crunchy. Thanks Debra! :) I'm loving it! Now I have to take the plunge with the rectangular one! Kymber, which property? I think you forgot the link!! The coffecino looked good. I made bullet proof coffee this morning for a pick me up - man, salty coffee is the thing. For what it is worth, I almost had The Ravishing Mrs. TB convinced to move to Cape Breton - and by almost convinced, she considered for something like 5 minutes. For my preference of not wanting to be around folks, it sounded perfect. So glad you jumped in and used your cutting board. I remember people who would sharpen one's knives. I would love for someone to drive by for that! Highly unlikely as i live in the wilderness, but only 20 mni. to town. Your dinner looks great. I love spaghetti squash! Sleeting and snowing on and off here in the Blue Ridge Mountains. I thought winter was over and had to rig all the heaters in the outbuilding again. I'd already put them away. Kymber, I just followed your link. Some of those properties on Cape Breton are breathtaking. Mercer Knives. My daughter in law (a chef) recommended them to me and I love them. I cook all the time and couldn't live without them. Just buy one at a time as you can afford it. And I love the look of your coffeecino. Yum! I start my day with exercise. Even when I don't want to, which is today. Ha. I really don't want to either, but I will. It snowed here yesterday. Thanks Tammie Lee :) I would love for a knife-sharpening truck to arrive at my door too! We were given a tip to maybe ask our butcher to do it for us. We know they take care of their knives, so we're going to ask him next time we're in town if he offers that service. Hi Harry :) The minute you put the heaters away, the temperatures will fall...last year, I put my winter clothes away too soon, then was too stubborn to take them back out as I shivered for a few more weeks lol. It's snowing here again this morning.